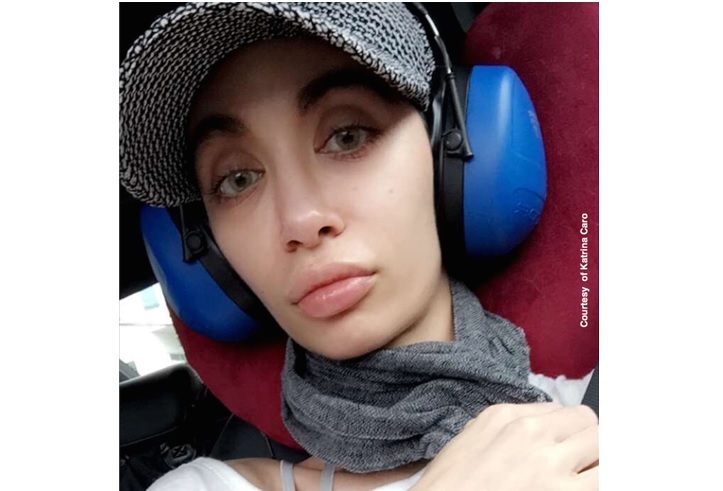 Katrina Caro’s hyperacusis developed after a blow to the face. The sobering story of her injury and its aftermath is told in the New York Post. Katrina was working as a nightclub waitress when she was punched in the jaw. What appeared to be a dental injury turned out to be far worse. The jaw pain spread to her ears, causing hyperacusis. She has tinnitus, too. Katrina’s ear pain worsens readily with noise, which also gives her spasms. Even a down coat is too loud. “I can’t stand the sound of the swishing waterproof material and the zipper,” Katrina says. “I have a rare condition called hyperacusis — intolerance and extreme sensitivity to everyday sounds. Most people do not know of this condition. Unlike you, I cannot live a normal life. Sounds that you do not even notice cause me harm. I need a safe environment in order to prevent further harm to me. I need your help. • Please lower your voice, silence your cell phone, and do not stand/sit close to my ears. • Please put me in an isolated area because I cannot sit in a waiting room. • Elevator doors opening and closing. I understand that you may cause me harm accidentally and that I accept as part of my new normal. A GoFundMe campaign has been set up for Katrina’s medical expenses. The story has now been picked up by the DailyMail and there is a Spanish version on an Argentina news site. Imvestigate RAM, radar absorbing material. It absobs sound better than anything. You can cut it to suit your needs. You can put it on walls in a room and will be amazed. I think it will help you. It is not cheap, but may be worth it for you. I hope this info helps. Know that you are in our prayers. I know exactly what you are going through. I even flew to Israel to be treated by Dr. Shemesh, supposedly the expert in the entire world. His treatments accomplished nothing. I have been suffering for over 9 years and would rather go to sleep and not wake up. Maybe scientist will find a cure, they could but they drag it out for so long I only wish they had it then they would be in a big hurry. Why can’t we find a damn cure ? With all the research out there this is crazy !!! Please help her and us that suffer everyday and do nothing but pray and contemplate suicide !!! For the love of God please find a cure !! Thank you !!! My latest audiologist told me, after years of professional people who are not helpful nor empathetic, that she never had a patient commit suicide over hearing loss but the same can’t be true of tinnitus patients. I felt, yes someone gets it. As a five year member of uncontrollable tinnitus problems, I now believe that this problem has no end. Worse yet I see people in everyday life living in a loud work life with no thought of future troubles. Sad, but true. Yes. Lets get real about finding relief aids; if we cant get a sure cure. There is no end. An audiologist told me it is a 10,000 piece puzzle and we have two pieces. in my country, the Netherlands i’m fighting the the law on this. there is no help, i’ve lost my home, my practice, my income, my total health because of hyperacusis. Best result is to go live in a car with silent engine, so you can dodge noiseoverload, wearing day and night heavy Industrial anti noissegear. which i heve been doing for the last two years. both the gear and the car. local towngouvernement has offered to install a professional noisecanceling room in my next house. The same as the hyperacusis testingfacilities use. costs 30-40.000 euro’s. We are so sorry to hear about the impact to your life. I too suffer from sudden onset hypercusses and life changing tinnitus. It happened when I got a bad cold/flu 3 years ago and was given codine to stop my coughing. I am allergic and threw up and coughed for 6 hours. When I woke the next day the damage was done and I felt as if I was under packs of florescent lamps and dentist drills. I also now have nonstop post nasal drip and have to clear my throat all the time. Loud noises and common things like refrigerators are very annoying. The hardest part is we look normal even as we have a pain level of 7 on a scale going on. I understand this woman’s pain and send prayers as I hope for all of us. I’m hoping stem cells eventually will offer a regenerative cure. Please help us find a cure!!!!!! People with bad tinnitus should be warned about the danger of loud noise making it worse and developing into hyperacusis. I had no idea this could happen and now it’s too late for me. I have hyperacusis so bad it’s difficult now for me to leave the house at all. Since I need to make hospital visits for another health problem, this puts me in a terrible situation. I cannot even wear hearing protection as I am then trapped in with the tinnitus and it is unbearable. I love life and fully appreciate the gift of it and its value but it now looks increasingly like I have no option but to fotshorten mine.